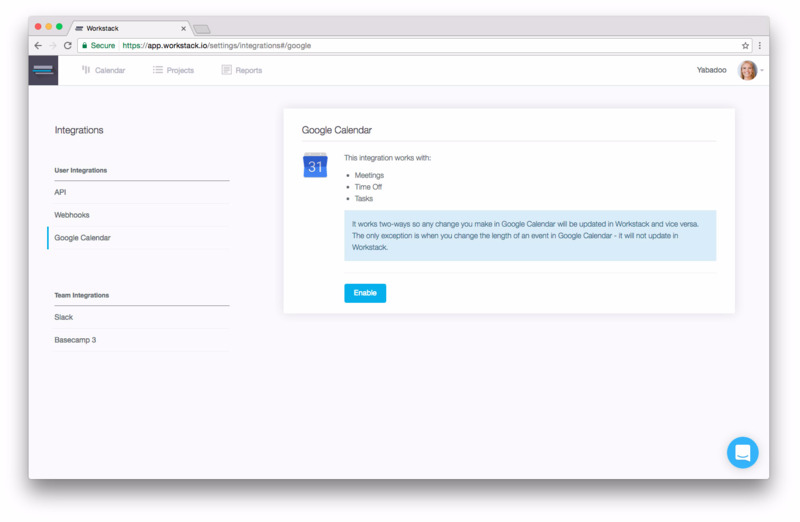 Any type of user can connect their Workstack account to Google Calendar. The connection is "per user" so this means items from your connected Google Calendar will only ever show in your stack in the Workstack calendar. Make sure you are logged into the correct Google account that you want to connect to Workstack. Open the Google Calendar settings by clicking Link to other apps from the admin menu at the top-right. Click the Enable button and Allow Workstack to connect to your Google Account. Then select the individual calendar you want to connect to. Remember this is a two-way connection so updates you make in one system will update the other, and this includes creating and deleting items. Changing the length of an event in Google Calendar does not update Workstack. Changing the name of an event in Google Calendar does not update Workstack. You'll need to include the word 'meeting' in the event name inside Google Calendar for it to be imported as a meeting in Workstack, otherwise it will be treated as a task. Events are appearing at the wrong date/time. This is most likely caused by a conflict between to the timezones of Google Calendar and Workstack - check to make sure they are the same. Changing the length of an item. Changing the name of an item. All my events from Google Calendar appear as tasks rather than meetings in Workstack. To ensure an event in Google Calendar is imported as a meeting in Workstack make sure to include the word "meeting" somewhere in the event name.